This sports bra features 360 degrees of breathable wicking and compression for performance-level comfort that keeps you contained and focused. Made of polyester and elastane with HeatGear wicking and 4-way stretch engineering. Wireless, dual-layer compression front with light foam panel for coverage. 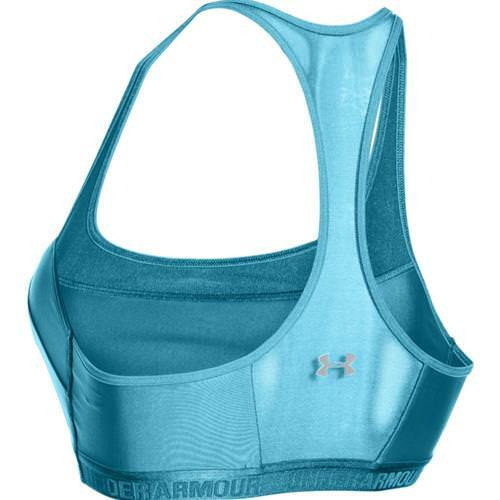 Smooth, narrower exposed elastic underband has repeated jacquard Under Armour logo. Inset, dual-layer, breathable mesh panel across top of front with sewn-on elastic trim. Triple-layer HeatGear construction ensures a contoured, natural shape and impressive Moisture Transport System wicking. HeatGear tech works best in 75-100+ degree Fahrenheit temperatures. Fabric rapidly evaporates away excess moisture from your skin to keep you feeling dry. 4-way stretch design lets you move in any direction with ease. Straps are made of ventilated mesh with sewn-on elastic at sides. Mesh racerback offers airflow where you need it and excellent range of motion. Reflective Under Armour logo on racerback.